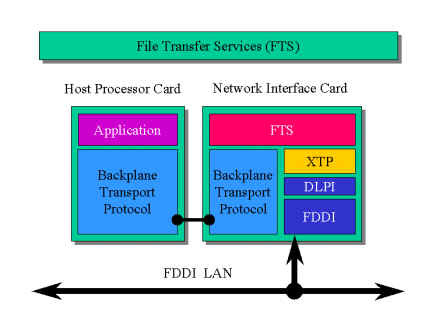 File Transfer Services (FTS) is an extended profile network protocol providing reliable data transfers by emulating connection-oriented byte stream transport between applications executing on different host processors on a local area network. Two host processors that share an FTS connection may be located either on the same backplane or within sub-systems that are connected by different Network Interface Cards (NICs). FTS uses an addressing scheme where every user thereof chooses a unique 64-bit name for the user's transport endpoint. The FTS transport addressing scheme is completely separate from the network addresses used by the NICs. This is because the NICs use dynamically-assigned network addresses, whereas communicating FTS entities use globally-administered transport endpoint names. The message interface to FTS provides a simplified OSI-like connection-oriented transport service between these transport endpoints. The data transfer over FTS connections is based on reliable byte streams. Multiple connections can be made between two transport endpoints. Each connection is unidirectional. FTS provides services to perform two types of data transfer, namely read requests and write requests. FTS supports a Go-Back-N flow control scheme that permits high bandwidth bulk data transfers.